Injuries have ruled former captains Sean Cavanagh and Michael Murphy out of next month's International Rules Test against Australia at Croke Park. 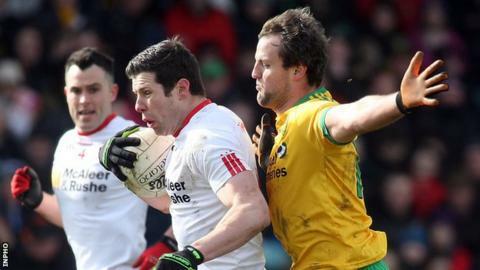 Tyrone forward Cavanagh has pulled out of Joe Kernan's squad with a knee problem while Donegal skipper Murphy is also on the injured list. Monaghan forward Ryan McAnespie and Neil McGee of Donegal also miss out. McAnespie's Monaghan team-mates Kieran and Darren Hughes and Rory Beggan are still part of Kernan's plans however. All three will line out for Scotstown in Sunday's Ulster Senior Club Football Championship quarter-finals, as will Mattie Donnelly, whose Trillick side meet Donegal champions Naomh Conaill. McAnespie was injured last weekend while playing for his club Emyvale. Mayo's Barry Moran and Dublin midfielder Brian Fenton will also be unavailable for selection for the one-off fixture on Saturday 21 November. Kernan, an All-Ireland winning manager with Armagh, is expected to confirm his final squad in the next fortnight.